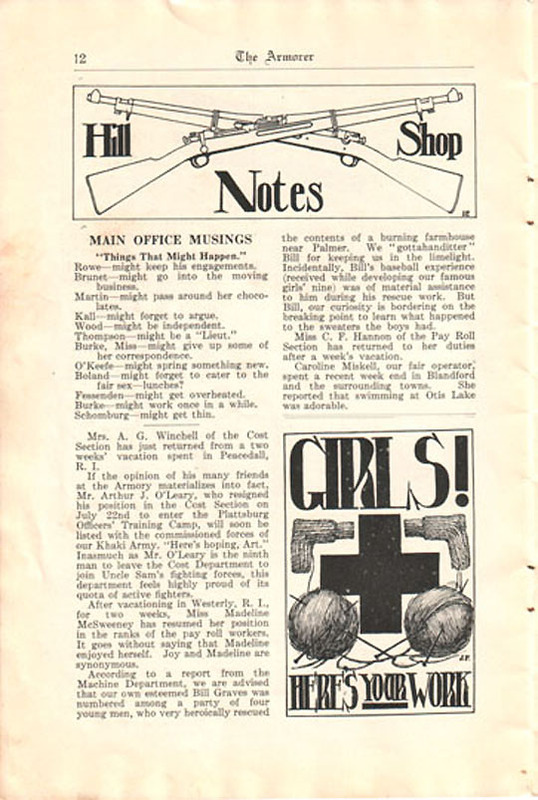 Armorer news, August 1918, page 12. 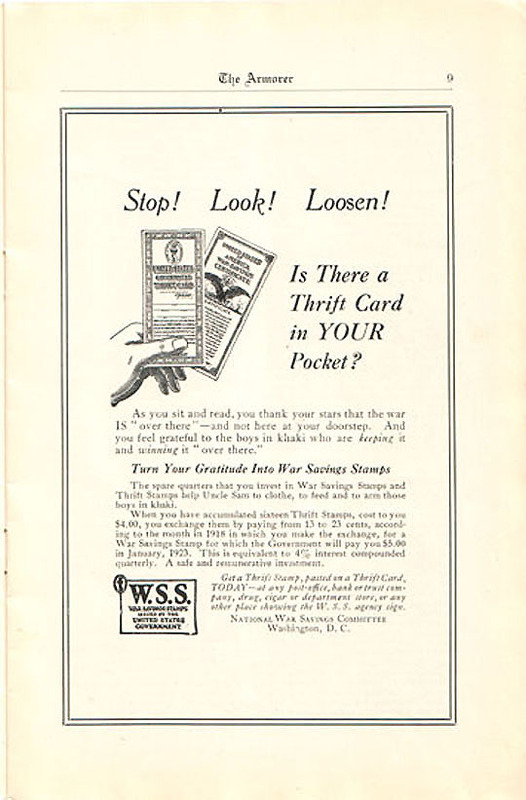 During the First World War, the United States created the Food Administration, an agency created to help find ways to convince its citizen to conserve food for the war effort. The Food Administration used propaganda to convince women to conserve food, equating conservation with patriotism. The Springfield Armorer published articles and propaganda pieces reminding women of their important role in food conservation. These articles helped to convince many women that their efforts made them “kitchen soldiers,” fighting the war abroad from the home front. The August 1918 edition of The Springfield Armorer had a picture that served as government propaganda. The basket’s contents showed foods essential to the war effort. This picture reminded women that their wartime duty involved saving food, specifically wheat, sugar, meat, and fat. The message at the top of the basket was intended to repeat to those reading the Armorer that saved food equaled a faster victory in war.1The propaganda program attempted to educate women in ways they could contribute by convincing them that food would win the war. Armorer News, August 1918, page 8. During World War I women became “kitchen soldiers” and food conservation became their patriotic duty. While men fought overseas women fought at home; “The crucial battleground became the kitchen table: ‘the question of planning meals grows daily more important, because it is more evident that food is to win or lose the war.’”2American housewives found themselves being told that if they saved at home they could save the nation.3The Armorer, in December of 1917 ran an article titled “Do your Bit in Food Conservation: General Rules” that outlined basic guidelines for the women that read the newsletter to follow in order to be patriotic and do their citizenly duty in saving food. It stated that only three meals a day should be eaten, recommended smaller portions, buying less food, and cleaning plates of all food at meal time.4 These tips encouraged women in their capacity as those responsible for feeding the household to avoid wasting food and help the war effort. Armorer News, May 1918, page 11. "Is your Thrift card in your pocket?" 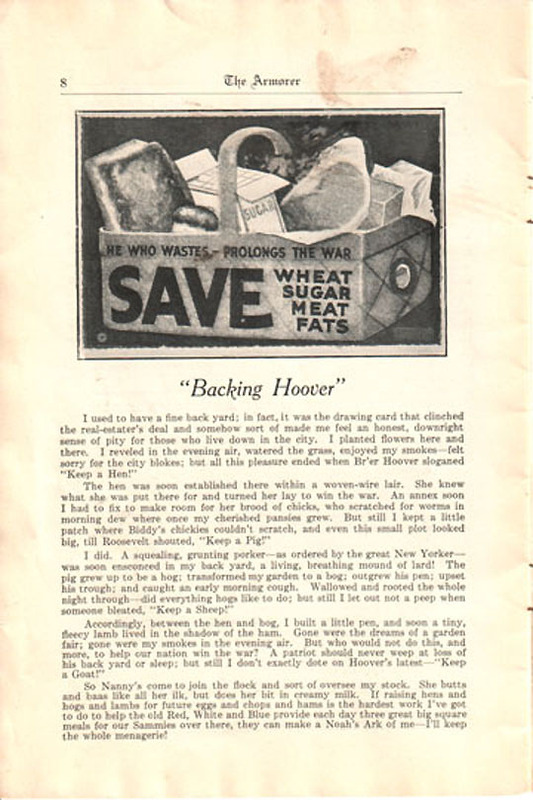 The Food Administration focused on saving wheat during World War I and used propaganda to remind Americans to save bread. The conservation of wheat remained so paramount to victory that Wilson officially proclaimed wheatless Mondays and Wednesdays. 5In light of the importance of not wasting bread, in Springfield, The Armorer ran an article reminding its readers to save bread. “Mr. Slice o Bread” is written from the perspective of the piece of wasted bread. The article gives the dimensions of the piece of a slice of bread commonly wasted; “I am the ‘bit left over;’ the slice eaten absentmindedly when really I wasn’t needed: I’m the waste crust.”6The article told the readers of The Springfield Armorer that collected waste crust from a whole week would add up to two shiploads or 9.380 tons of wasted bread.7It then reinforced the notion that people saving bread would win the war because more bread would be available to go overseas. 2 VanWienen, Mark. “Poetics of the Frugal Housewife: A Modernist Narrative of the Great War and America.” American Literacy History 1995 7 (1): 55-91. p. 67. 3 Gordon, Marsha. “Onward Kitchen Soldiers: Mobilizing the Domestic during World War I.” Canadian Review of American Studies [Canada] 1999 29 (2): 61-87,, p. 67. 4 The Springfield Armorer, vol 1 no 1, December 1917, p. 9. 6 The Springfield Armorer, December 1917, p. 6. 7 The Springfield Armorer, December 1917, p. 6.